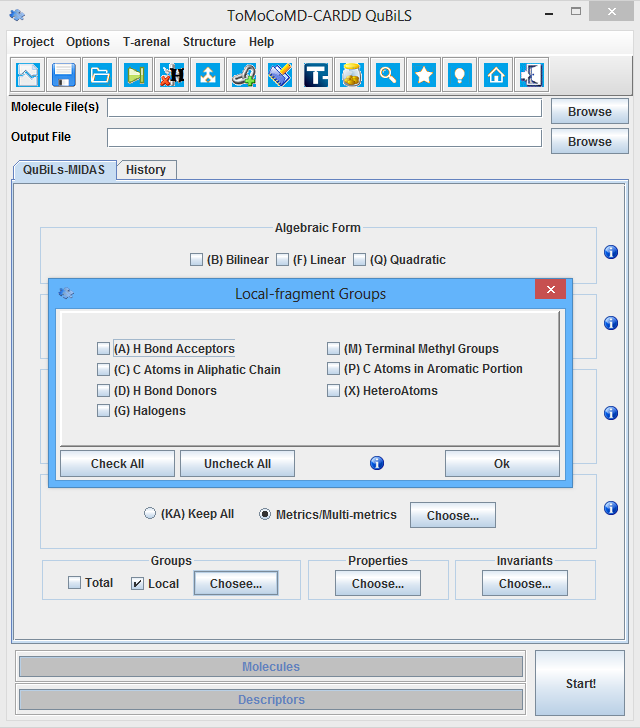 QuBiLs-MIDAS software is for the calculation of 3D molecular descriptors based on the two-linear (bilinear), three-lineal and four-linear (multi-linear or N-linear) algebraic forms. 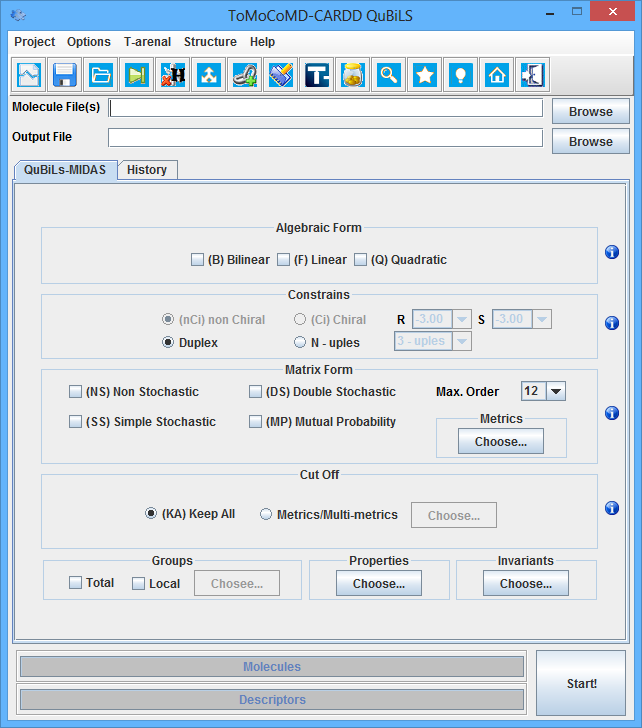 Thus, is the unique software that compute these kinds of indices, establishing relations among two, three and four atoms, applying several (dis)similarity metrics or multi-metrics, matrix transformations (simple-stochastic, double-stochastic and mutual probability), cut-offs, local calculations and aggregation operators. 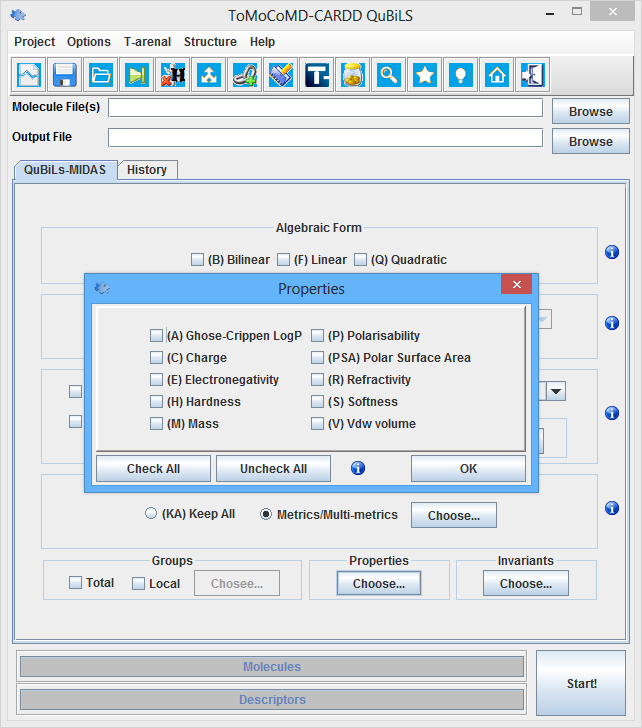 QuBiLS-MIDAS software was developed in Java programming language, and it uses the Chemical Development Kit (CDK) library for the manipulation of the chemical structures and the calculation of the atomic properties. 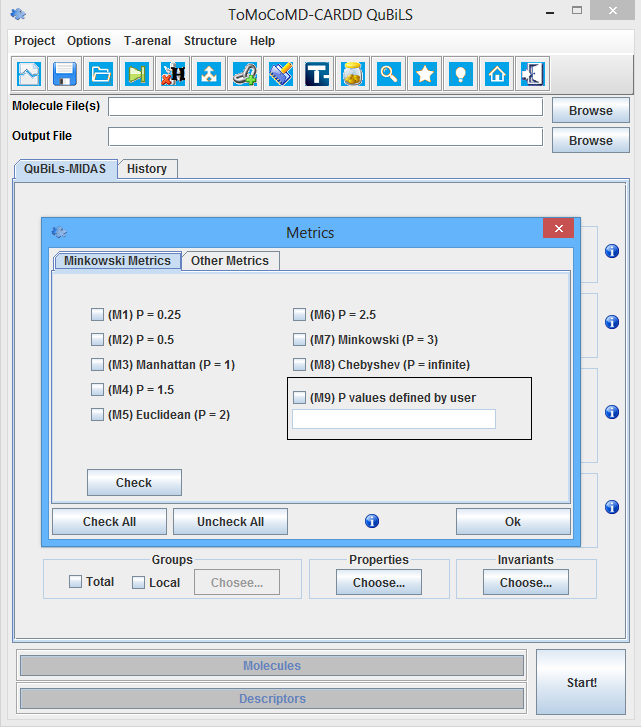 This software is composed by a desktop user-friendly interface and an API library. 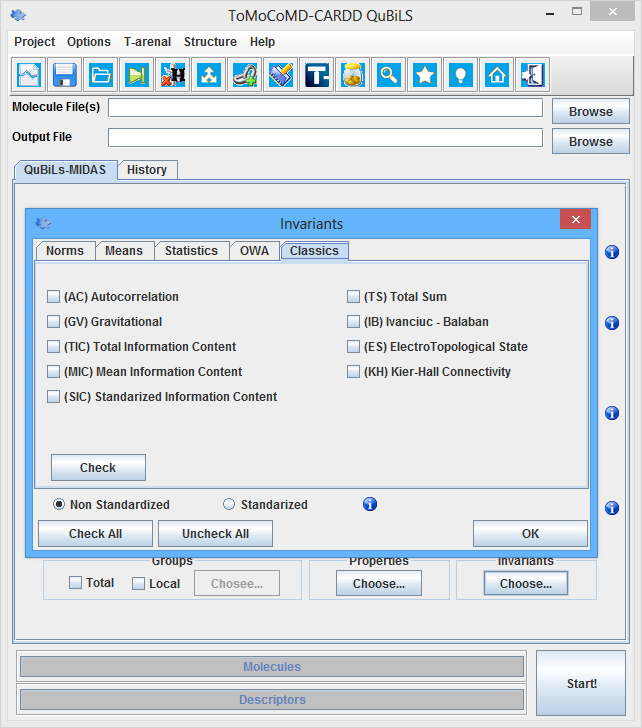 The former was created to ease to the users the configuration of the different options of the molecular descriptors, while the library was designed to be easily integrated in other software for chemo-informatics applications. 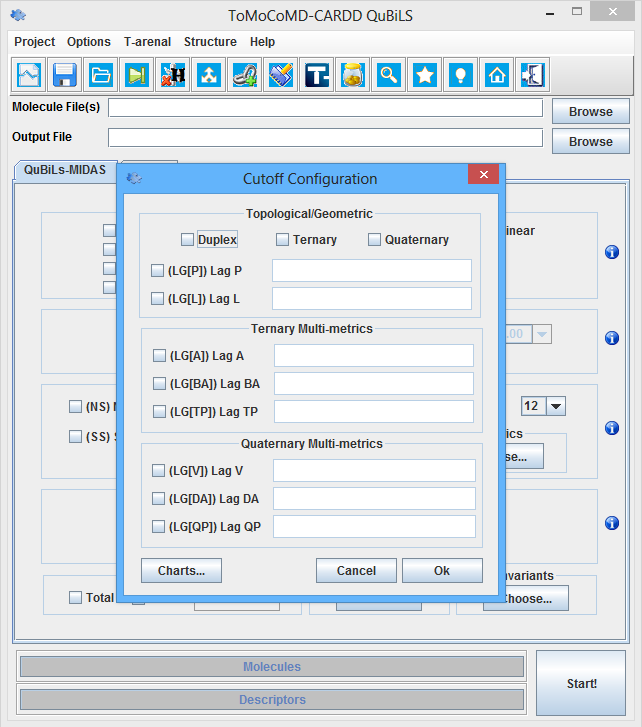 Also, the QuBiLs-MIDAS software presents functionalities for data cleaning tasks and for batch processing of the molecular descriptors. 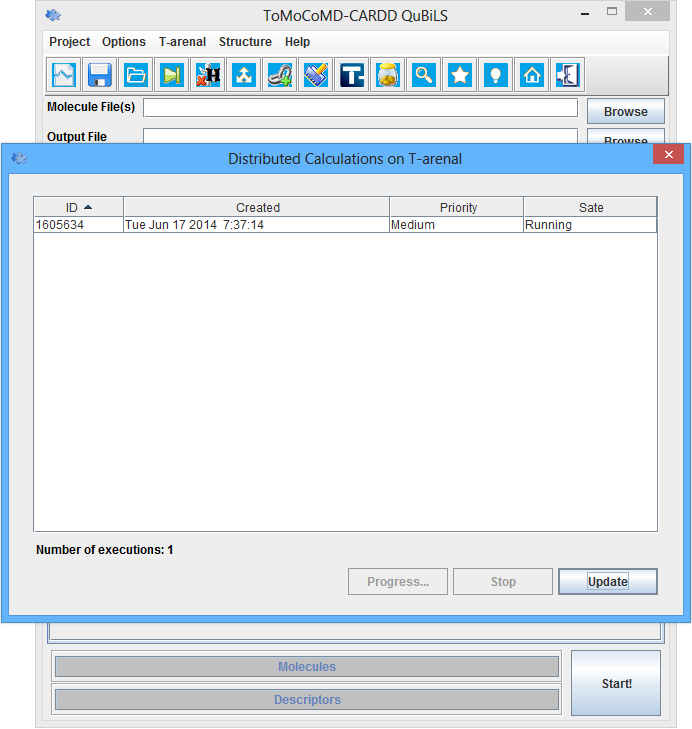 In addition, it has as feature the parallel and distributed calculation of the molecular descriptors through the use of all available processors in the modern computers, or by using several heterogeneous workstations by means of the T-arenal Platform of Distributed Tasks. QuBiLS-MIDAS software is designed to run on any UNIX/LINUX or MAC platforms, as well as on microcomputers running Windows 95, 98, ME, 2000 or XP, Vista, 7 and above. QuBiLS-MIDAS is platform-independent software. QuBiLS-MIDAS software only requires Java(TM) 8u92 Runtime Environment or superior on the system.